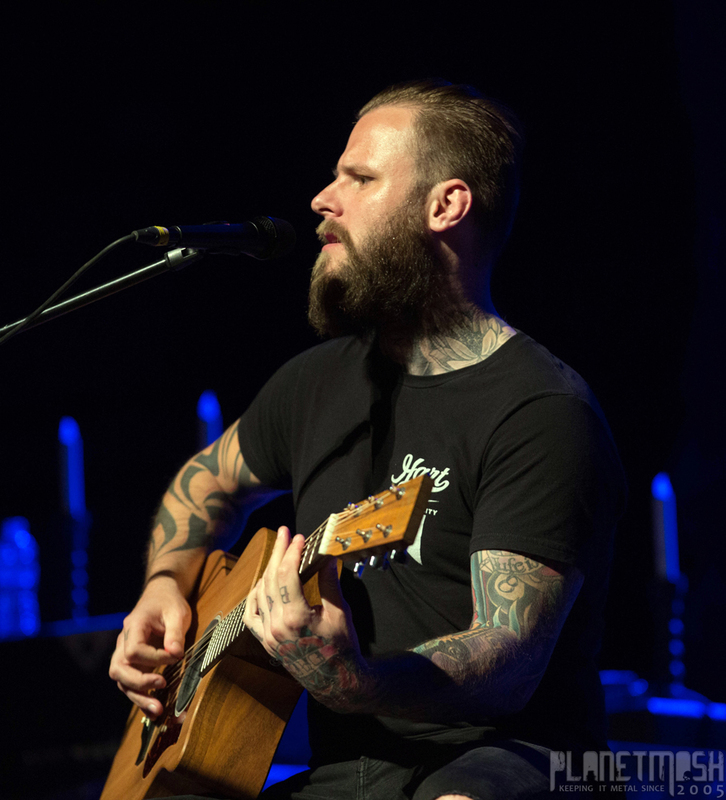 Support on Beth hart’s current tour comes from The Kris Barras band. I’ve seen Kris Barras and his band play an electric set before, but tonight is my first time seeing them do an acoustic set (it’s also the first time they’ve done a tour playing acoustic sets). The venue was pretty much full before they started (it’s always nice to see people turn up to watch a support act). It’s an absolutely fantastic set. He plays guitar and sings while accompanied by a drummer and a guitarist/keyboard player – only the bassist is missing on the acoustic shows. The songs from the new album (The divine and dirty) are great songs normally and when performed on electric guitars, but sometimes songs don’t translate well between electric and acoustic. Happily thats not the case here – the songs work extremely well acoustically, and with songs such as “Watching over me”, there’s a more intimate personal feel to it. It was clear from the audience reaction that he was going down well, and during the interval this was more than confirmed by the large number of people buying stuff from the merch stand and asking him to sign things. A fantastic start to the night. After a short interval it was time for Beth Hart. Her band took to the stage and started playing but there was no sign of Beth herself. Then her vocals started to come through the PA and people peered forward to watch her enter the stage, only to quickly realise she wasn’t on stage – she’d entered the venue through a side door and was singing as she slowly made her way along the aisles around the auditorium till she reached the stage. Even then she didn’t go straight on stage but instead sat on the steps and sang the rest of the first song. Unusually for Beth Hart, she sticks to the setlist – well for the first half anyway. After that… well that became more of a typical Beth Hart show – completely improvised as she effectively tore up the setlist and sang other songs instead. It’s something that I really enjoy about a Beth Hart show – while some artists stick to a single setlist for the entire tour and some even script all the bits where they talk to the crowd, with Beth Hart it’s not like that. Beth Hart performs from the heart and so if she’s feeling at ease then she might do some quieter more intimate songs, or if the mood takes her she might do some more lively songs, so even if you went to every show on her tour I doubt any two shows would share an identical setlist. It’s something that also shows just how good her band are as they have to be able to react almost instantly to a change of set, as well as making sure they know most of her catalogue. The dialogue certainly isn’t scripted either, and she talks more openly and honestly about things than you’re likely to hear another singer do on stage. She introduces a lot of the songs, telling the audience the background to songs such as “With you everyday”, about how she falls more in love with her husband every day. Sometimes she just sings, sometimes she plays guitar, and sometimes she plays piano, depending on the song, and her vocals vary from powerful and strong, almost rock, to beautifully soft and full of emotion. She’s such a versatile singer it’s impressive. At a couple of points in the show her band go off and she performs solo, sitting at the piano, playing and singing, and it’s at those times it feels such a small intimate gig despite it being a packed out venue. Her songs span a range of things, from the best parts of her life such as her love for her husband Scott, to the real lows she’s had in the past, and then there are some fun quirky songs such as “The Ugliest house on the block” – written about the place she and her husband used to live, which was as the title says, the ugliest house on the block. Beth Hart is an incredible singer and an incredible live performer, and whether you’re a blues fan or even a rock fan, I’d recommend going to one of her shows.